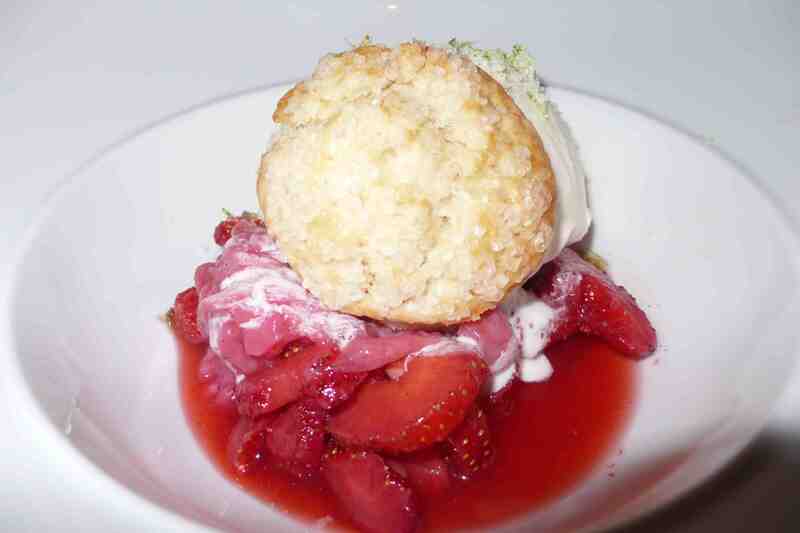 The menu at Kitchen 1540 encourages people to share plates and new tastes. It is divided into several parts, including starters, raw plates, oysters, entrees, extras, cured meats and cheeses and dessert. The new restaurant which opened in November of last year is light and airy with lots of seating options – the central dining room with vaulted ceilings and modern tables with a great view of the kitchen, private dining in a room surrounded by wine-encased glass walls or outdoor seating in the cabanas around a fire pit. I was fortunate to be able to sample a tasting menu of Paul McCabe’s modern American cuisine while doing a story on San Diego getaways. 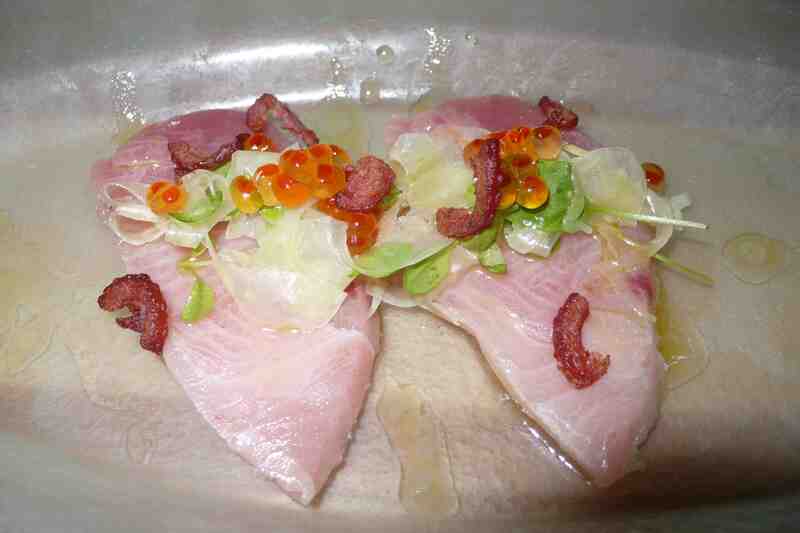 It began with the Hiramasa Sashimi, above, with compressed fennel, duck cracklings and stellhead roe. It was paired with New Zealand Sauvignon Blanc from The Crossings winery. Next came a playfully plated Mano de Leon Scallop, featuring a popcorn puree, baby corn and a maple syrup reduction with some popcorn on the top. Buttery and delicious. 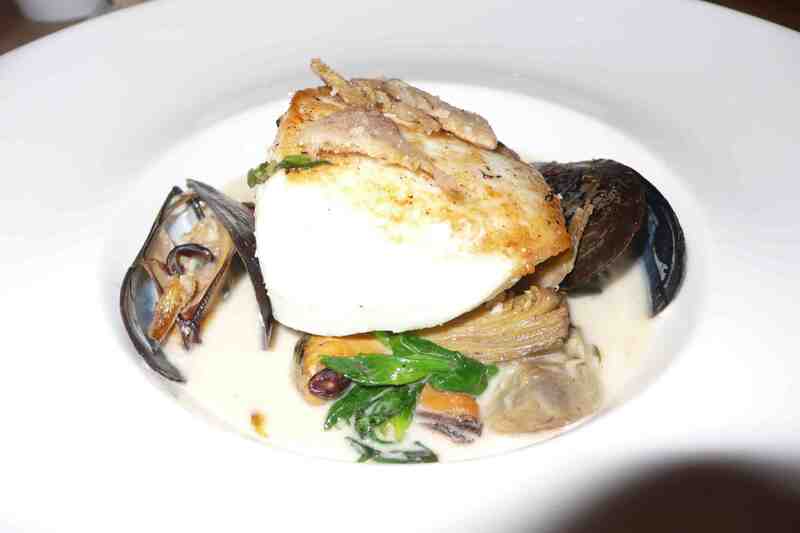 The broth in this Alaskan halibut dish was really good. It included fava beans, artichokes, and mussels with some preserved lemon rind. It was paired with a chardonny from Wild Oak by St. Francis winery. Yummy. The foie gras dish came with the foie gras perched on a 400-degree black sea rock with crackling blood-orange pop rocks (yep, like the candy, and it was a nice accent to the dish) and a citrus emulsion. 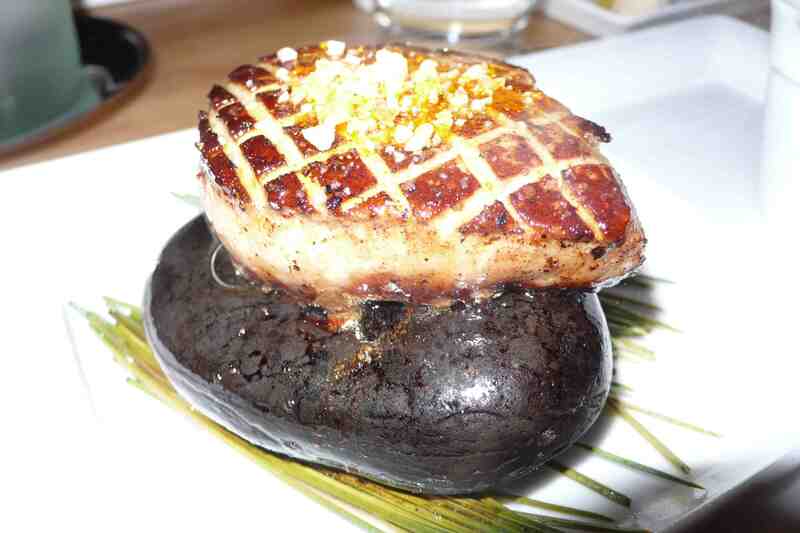 When offered I will never turn down foie gras, and this dish was my favorite. 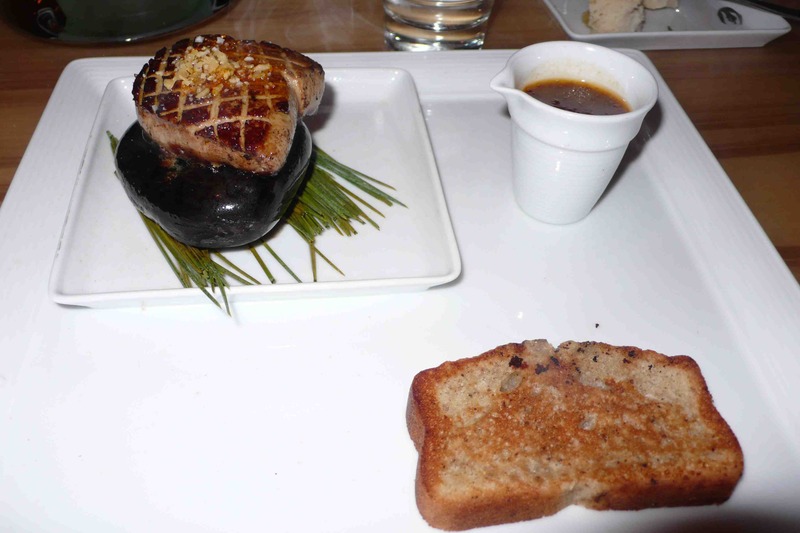 The foie gras was perfectly cooked. 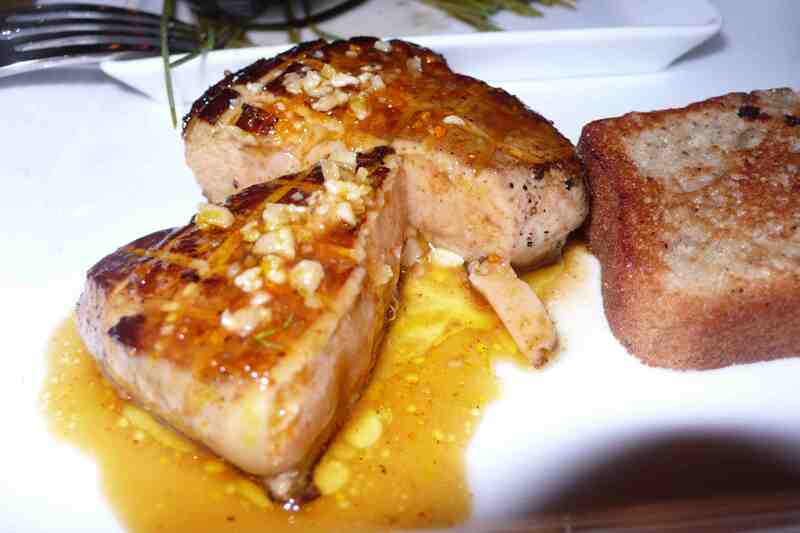 Okay, three foie gras pics are excessive, but how can you not love foie gras? Here it is before I dived into it. 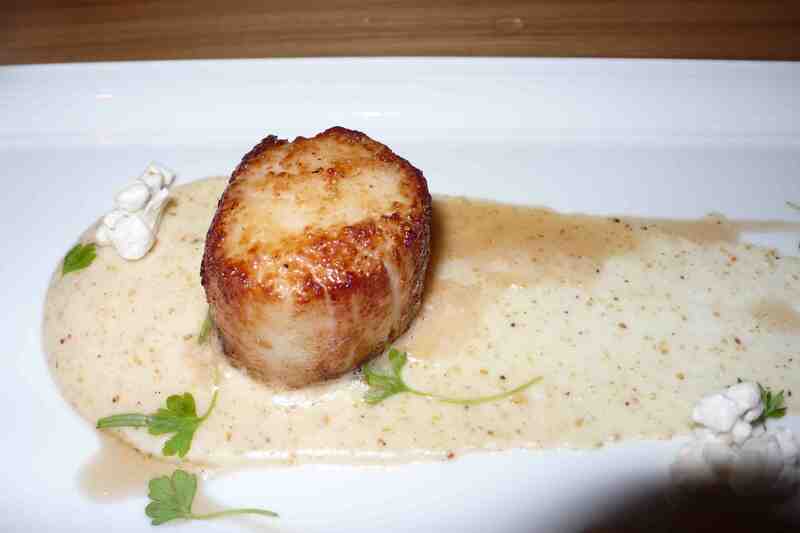 It was paired with sauternes, an after dinner dessert wine that pairs perfectly with the foie gras. After eating this dish I slept really well. My final course before dessert was a succulant Kurobuta Pork Shoulder with herb gnocchi, napa cabbage and smoked bacon pickled onions. 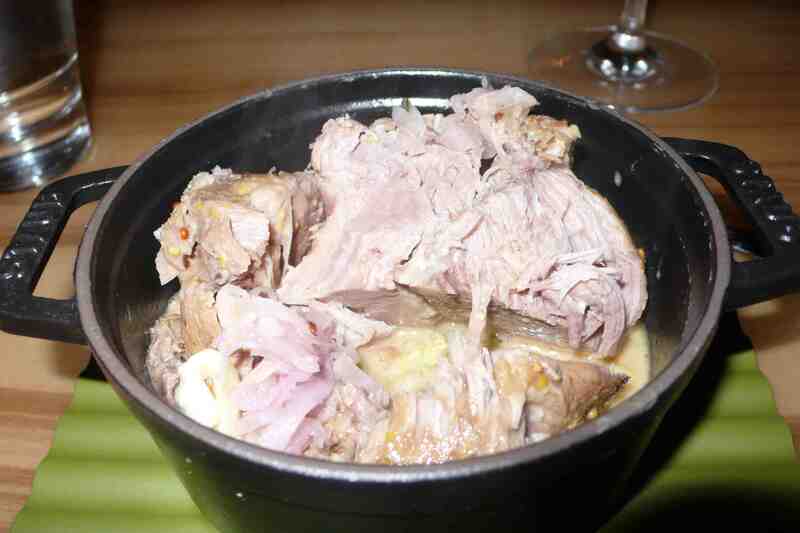 The pork was tender and rested on pillows of fresh gnocchi. Also delicious. Paired with a Cambria Syrah from the Santa Maria Valley. 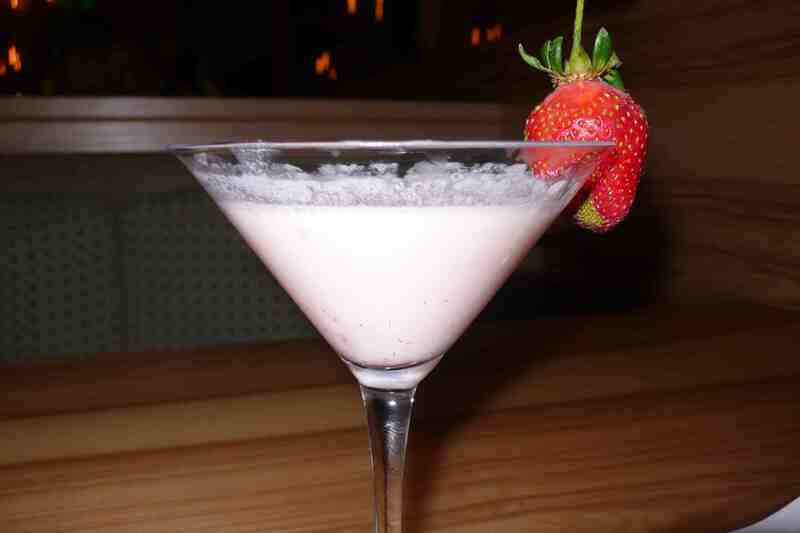 My final dessert course was a strawberry martini and fresh strawberry shortcake with vanilla ice cream. Everything on the menu was cooked perfectly and tasted great. Kitchen 1540 is located at the L’Auberge Del Mar, 1540 Camino Del Mar, reservations recommended at 858/793-6460.